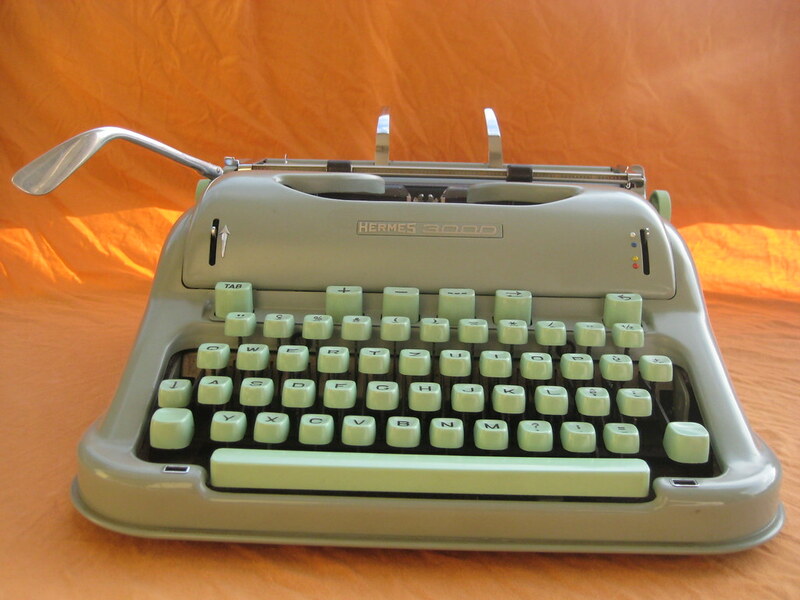 I never thought I'd be drawn to these gleaming black metal typewriters, but here we are. Far cry from the candy-colored Annabellas and ABCs of yore, but very attractive in their own right. Type-bar macro shows that some cleaning is order (maybe even overdue! ), but it hasn't gotten bad enough to affect the quality of the text produced... yet. Sticker from dealer in top of case, and a couple of pages from the user manual. A careful eye will spot a few of the mechanical "shortcomings" I listed as peculiar to this Remington Junior: no right-hand margin stop and no right-hand carriage release lever. I was quite happy that the handle of the case had survived intact all these years, a good indication that the typewriter had been quite well-preserved. My answer to Florian's autumn-themed meme. Tour de Sauvabelin in Lausanne on a crisp fall day. 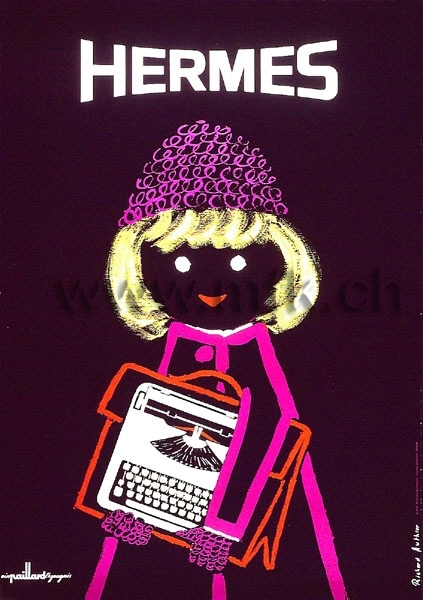 Young girl cheerfully makes off with a stash of Hermes typewriters.... never to be seen again! 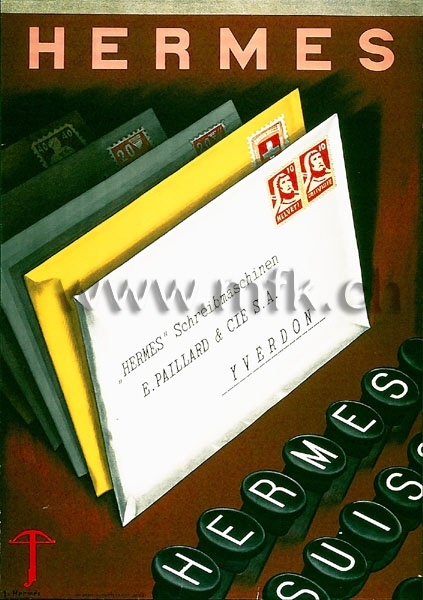 If you would like to see more images from the Museum's Paillard collection, visit their Collection Database and enter "hermes schreibmaschine" in the keyword field. For more than just Paillard, try "schreibmaschine"... they have many other brands represented too! It's a fantastic assortment, and I hope it will be made open to the public as more people clamor to view it. Another look at the Racer? Mais bien sur... although I didn't have the satisfaction of bringing this home with me, I made sure to spend a few moments just admiring it. 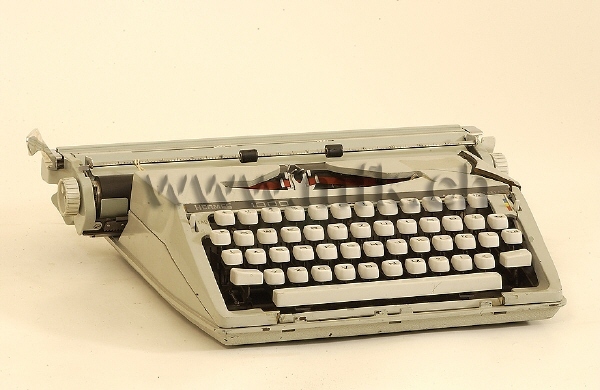 Will Davis mentions on his site that the semi-portable Rooy typewriters have striking designs which are underappreciated because they are not often seen... how true! A look at the Typ-Fix - well-used to be sure, but still has some life left. The back of this is a light blue color. Hanging out nearby were two Hermes 2000s and a wide-carriage Olympia SM-7. I am fast becoming the blogger caught without a good camera at inopportune moments... oh, dear. Elite typeface, but charming in its way. I don't know if I like that the ribbon cover is the entire front of the machine, though. The Facit 1620 from which we nabbed the typ-fix! Finally, a handyman who had noted my disappointment at not getting last week's Typ-Fix and had been planning to fashion a homemade one contributes a review and comments on the backing sheet. 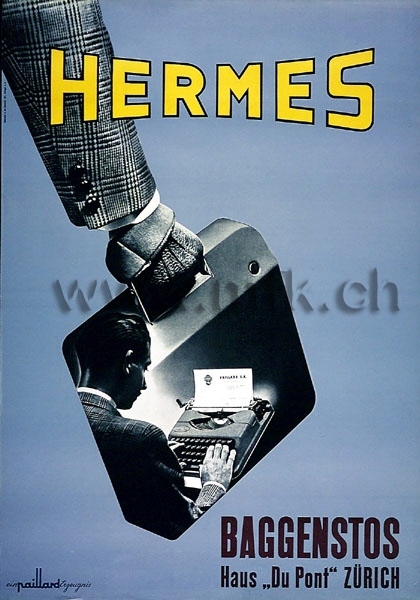 Fitting that the first find was a Swiss classic: Hermes 3000 (unbelievably pristine condition, too). This Triumph was beautiful too; however we all spent too much time cooing over the Hermes to pay much attention to it. 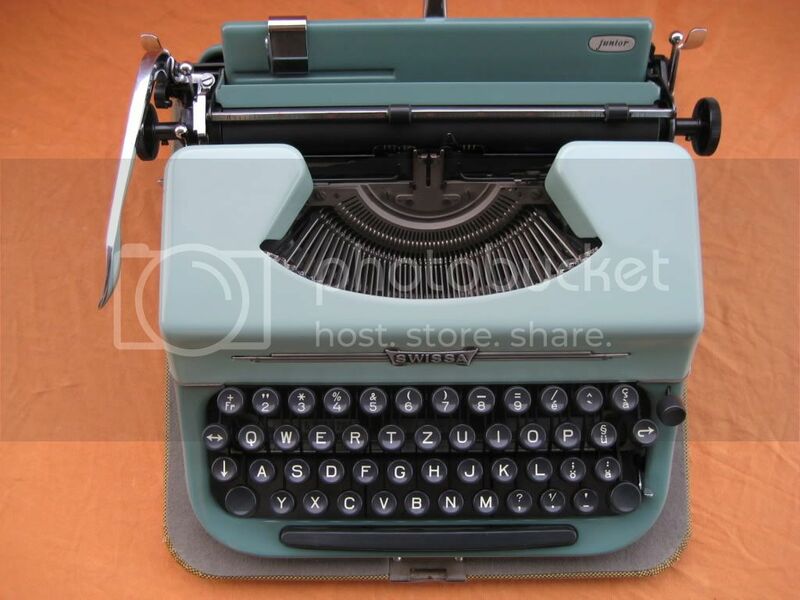 While there were only a couple of typewriters at HIOB, I was rather impressed by the good condition of the ones we found. Three generations of Hermes Media: glossy black from the '30s, mint green from the late '60s, and army green from the '40s. All in one store! It was a Hermes kind of day, indeed. ...and yet another Media, this time from the early '50s. The store owner had an impressive collection indeed, but I couldn't help worrying that it was due to low turnover - how many of these machines had been lingering there for months? and this Royal Quiet de Luxe (first time seeing one of these!) with a disgraceful skipping problem (tsk, tsk). More after the cut... yes, it was a very interesting day! I have been reading much more about frakturschrift and blackletter fonts in general than about the Senta in particular; in fact, I can't say I would have gotten a Senta if it were not for this one's intriguing typeface! Nevertheless, I'm glad she's in such good shape, with intact rubber feet and no rust to speak of. Early Senta 3-bank portables came in a large molded wood case; fortunately this one arrived in a much more practical square suitcase. There is also a German website devoted to nothing but blackletter: www.frakturschriften.de. 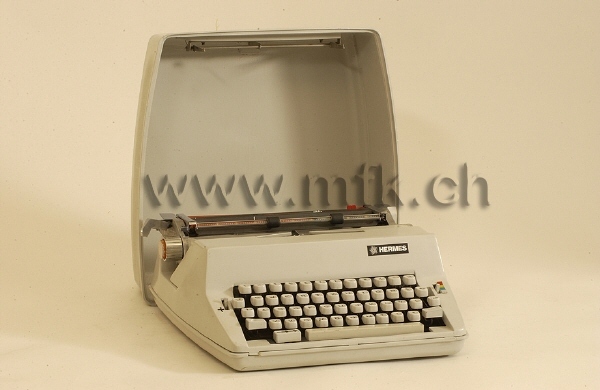 I read through this thread on their forum about the elusive search for fraktur typewriters, helpfully - if a bit clumsily - translated by Google. I found out that the definitive book on blackletter was written by Judith Schalansky in 2008; the Amazon reviewers seem to like Fraktur Mon Amour too. 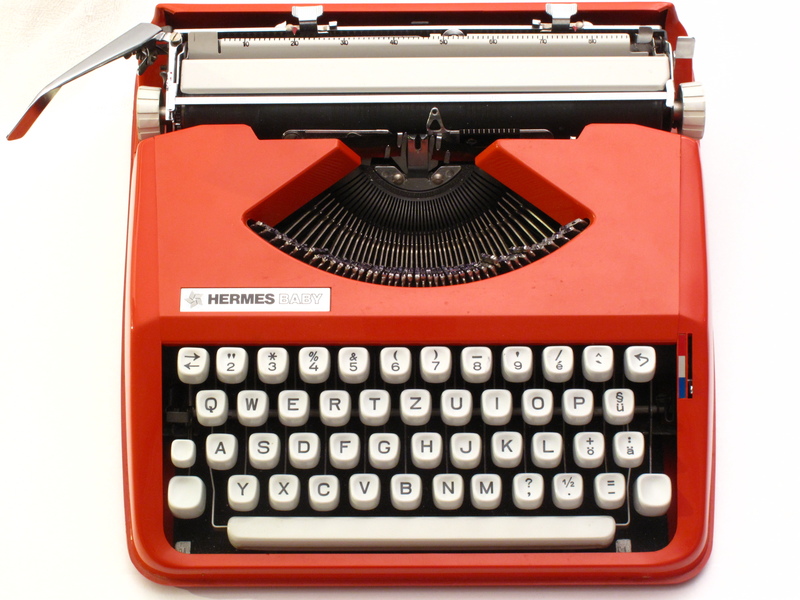 Something to put on my wishlist, if just to leaf through - it is more about digital fraktur typefaces, though I'm sure she must mention typewriters at some point.